Next working day personalised champagne UK delivery - order before 1 p.m.
No wedding is complete without a few glasses of something bubbly! Go off-list in style and add a unique touch of sparkle with stunning Personalised Wedding Champagne and Personalised Wedding Prosecco. Miniature bottles for wedding favours are a great idea as they can be used as place settings and make a lovely gift for your guests to take away as a memento of your special day. 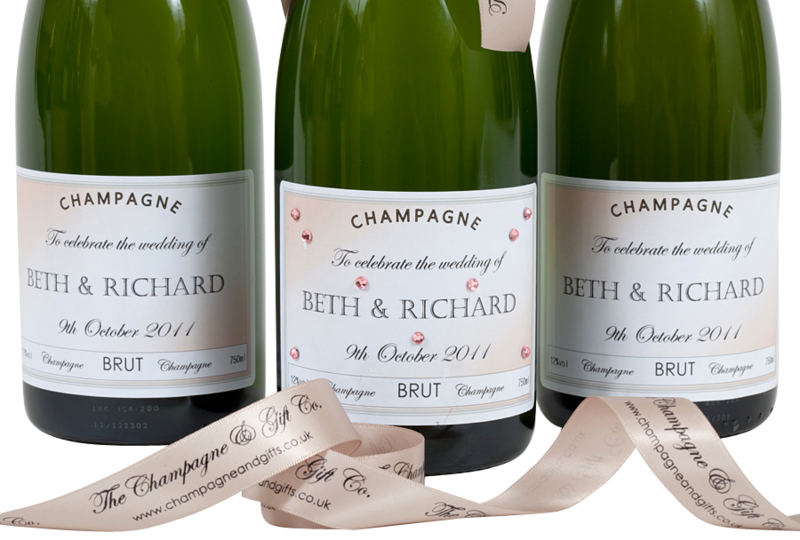 Personalised Wedding Champagne - a special way to say Thank You! Your wedding is such an important event that we believe those who helped to plan and organise it deserves an exceptional reward. Personalised Wedding Champagne gifts are the perfect way to say Thank You to the Bridesmaids, Best Man and anyone else who deserves special thanks for their hard work and efforts. 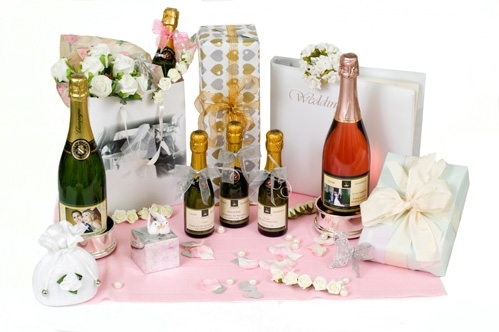 Champagne is a vital ingredient to any wedding and The Champagne & Gift Company have a selection of personalised champagnes, prosecco & wines to make sure the big day is a unique and memorable. 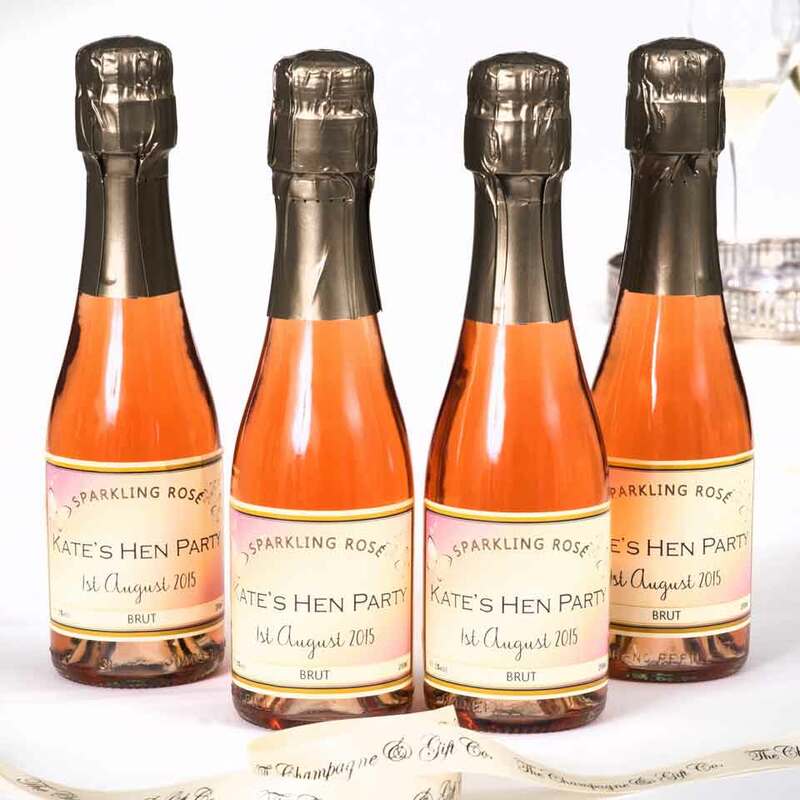 Personalised champagne is used for the toast, as wedding favours, or for 'Best Man', 'Father of the Bride', 'Mother of the Bride' and 'Maid of Honour' gifts. We offer a bespoke, fully tailored service and can match the label with the colour of your wedding theme. Please just contact us and we would be delighted to help. and one of our champagne experts will be happy to advise. 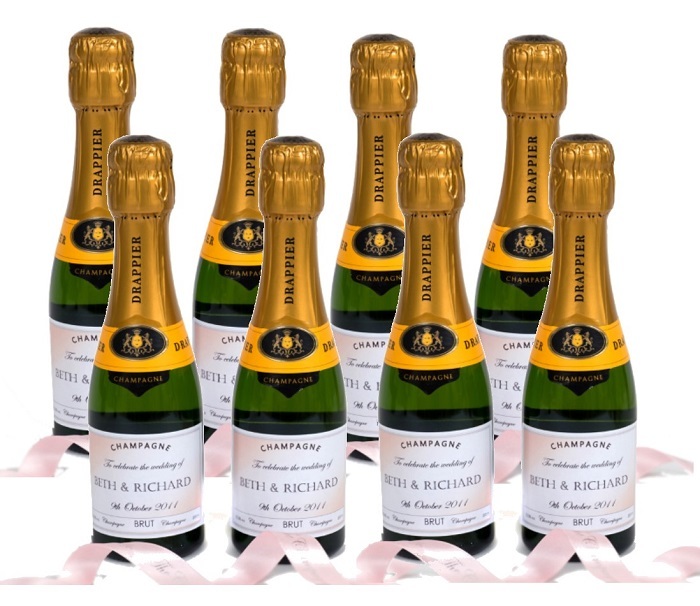 Personalised Champagne wedding favours will add a touch of class to the Wedding Reception tables. A compact size, they are perfect to give to your guests. 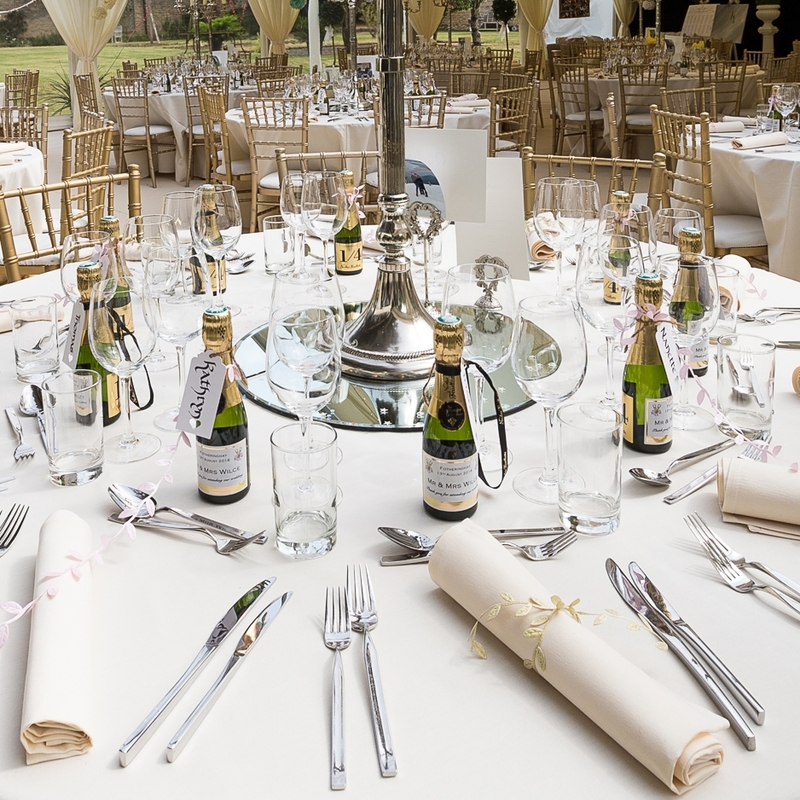 Your guests will be pleasantly surprised by your tasteful choice of Champagne Wedding Favours and will appreciate having their own personalised wedding Champagne. 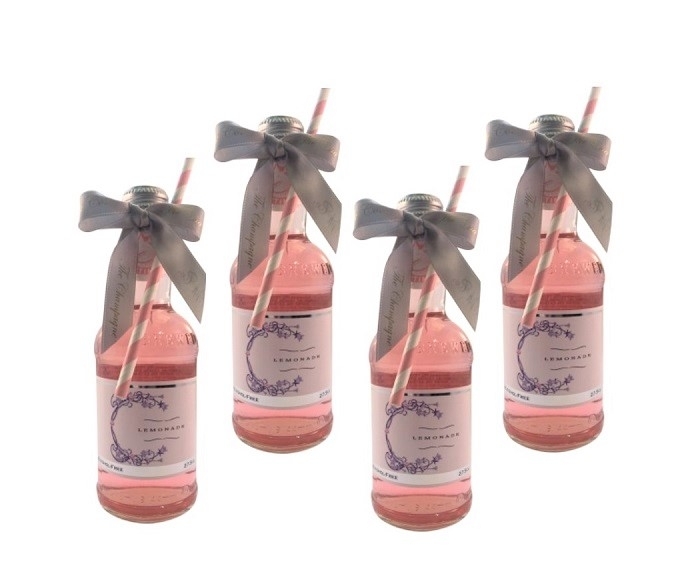 Our wedding Champagne favours can be finished with a beautiful "flurry" of ribbon for an extra special touch. 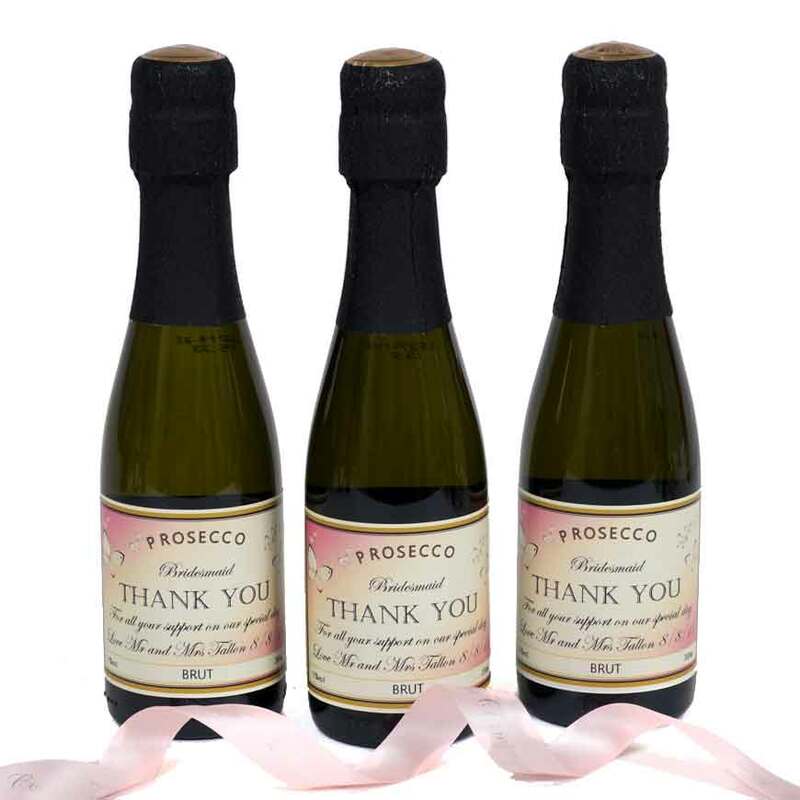 Our beautiful bottles of personalised wedding Prosecco are ideal as wedding favours. They look amazing and add an extra special finishing touch. 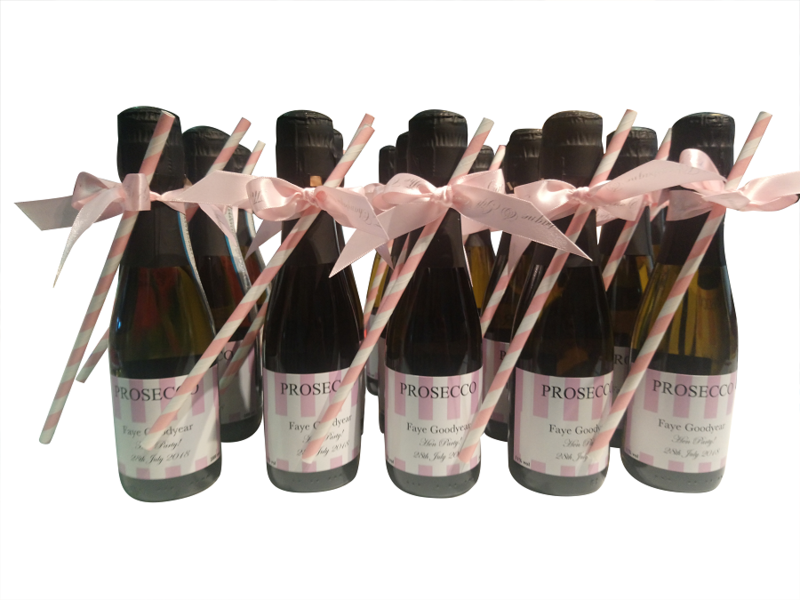 We can also create personalised sparkling wedding favours with other wines and non-alcoholic bottles. Contact our friendly team to discuss your requirements. 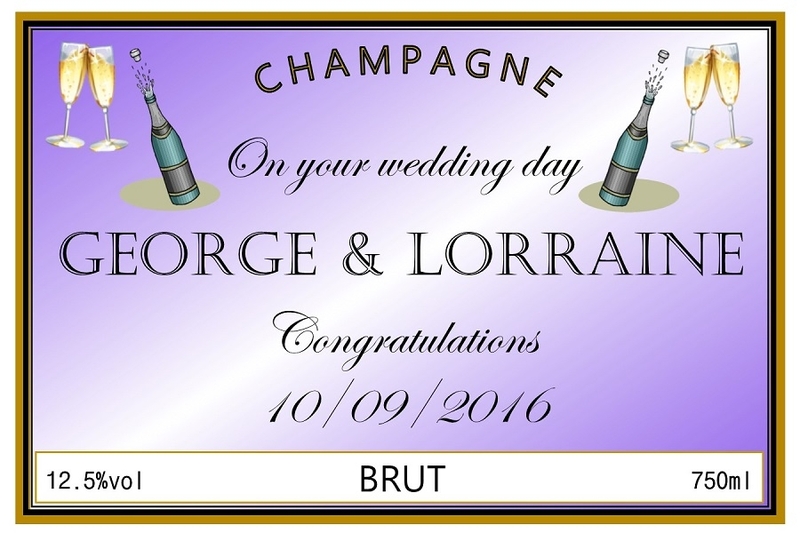 Personalised wedding Champagne also makes a great surprise gift for the future bride and groom from friends or work colleagues. You can add a personal message and even include a photo on the label to make your personalised wedding champagne gift more intimate and special. Our personalised wedding Champagne bottles are also a fantastic way to thank everyone who has been part of your special day. 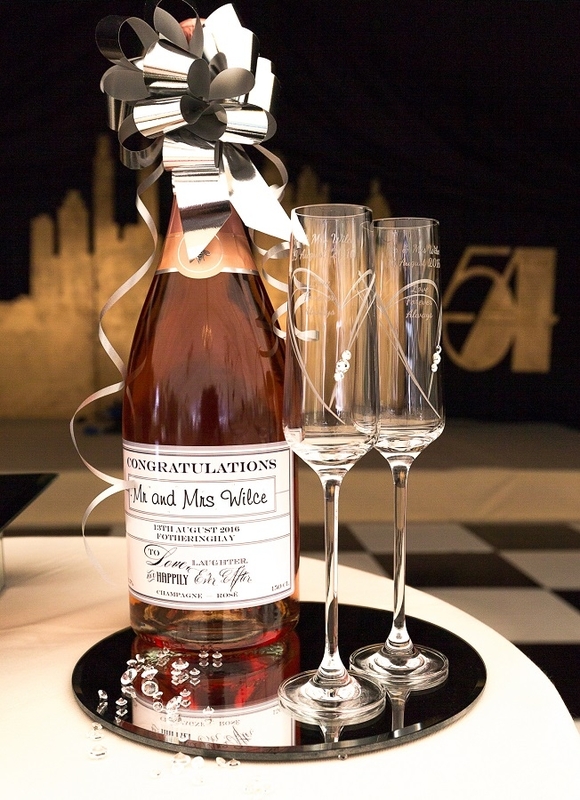 Why not send the parents of the bride and groom their own personalised Champagne bottle? We can create personalised Champagne bottles with names on for the guests of your choice. Alongside the Classic Brut Champagne, we also offer a variety of different Champagnes all of which can be personalised. 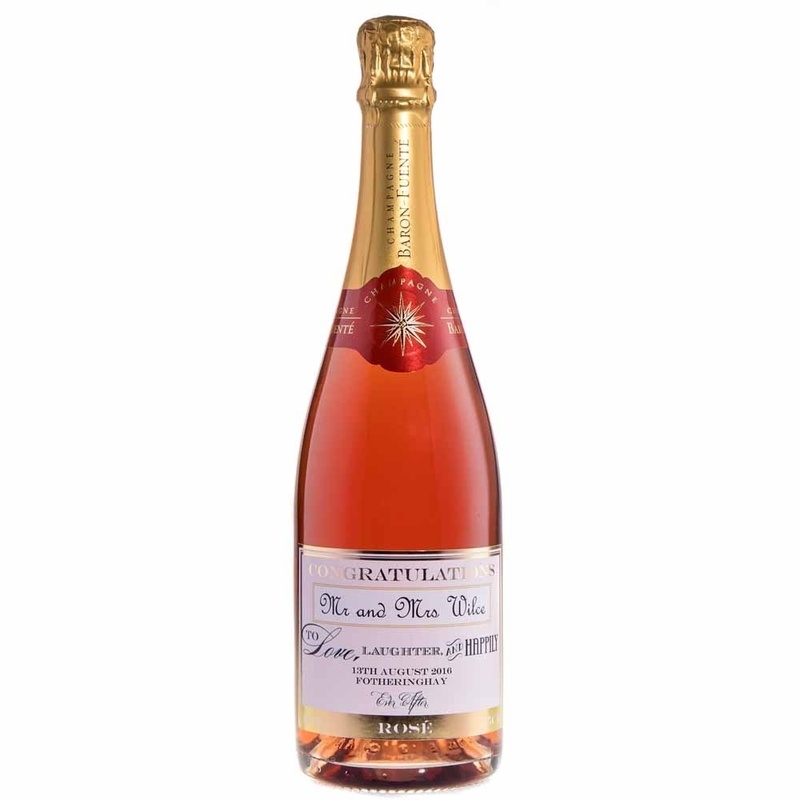 A bottle of personalised wedding Rosé Champagne will add a touch of colour to your event or a bottle of personalised wedding Grand Cru Champagne will add elegance to any table setting. mini, half, magnum and Jeroboam size Treat the happy couple to our International Gold Award winner Looks amazing and tastes even better! Are you looking for a gift that is different and unique - something for the couple with everything or two people with a love for unique design? Thinking outside the box is not too easy but a personalised bottle is a unique and thoughtful gift. 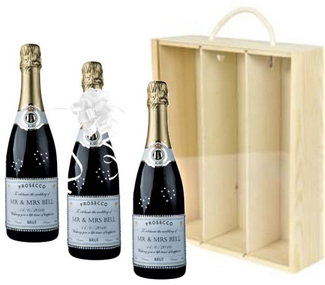 A personalised Champagne or personalised Prosecco gift, beautifully decorated and boxed, with the Bride & Groom's name and wedding date, makes a perfect luxury wedding gift for the happy couple's big day. It is "more than just a gift" it is a special memento that will be treasured. All our wedding gifts are beautifully presented - a pleasure to send and a delight to receive! Our team have been trained in the art of gift wrapping by Jane Means "Gift Wrapper to The Stars!". She has handed down her tips and tricks and we love making everything look very special. You can choose to have your gift wrapped in our "Finishing Touches" section. Special personalised Prosecco giftset for a special day! Looking for something special to give to the happy couple? 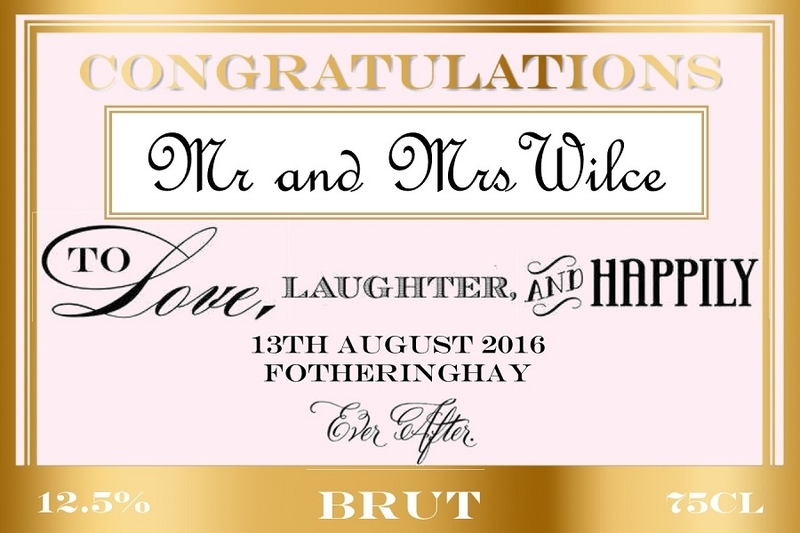 Create your own personalised wedding Champagne gift with a special message on the label. Why not add a photo of the bride and groom to the label for a delightful personal touch? A bottle of personalised wedding Champagne makes a unique gift that will be treasured. You can add a touch of glamour to your gift in "Finishing Touches" - choose a stylish gift, exquisite "New York" lining or add sparkle with crystal gems. 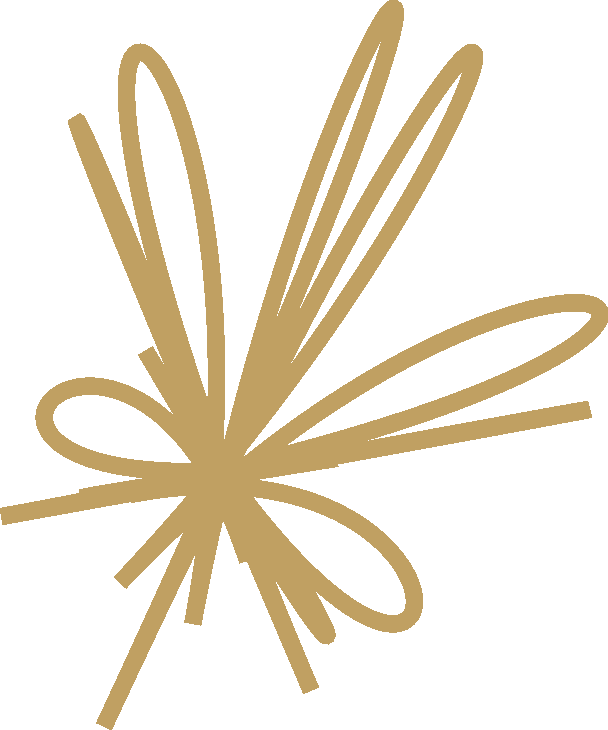 For a luxurious finish, we also offer two professional gift wrapping services. 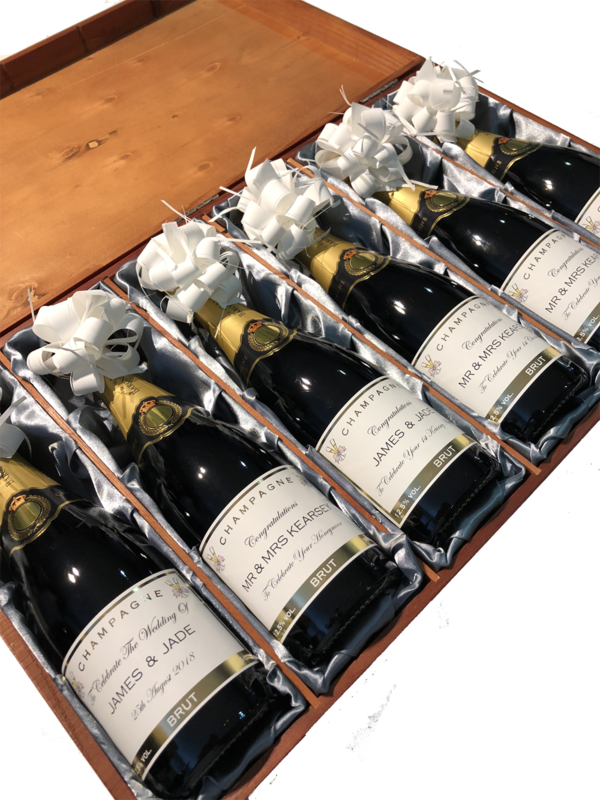 We have an exclusive collection of luxury vintage Champagne gifts which you can personalise Choose from our special selection and create your very own personalised wedding Champagne label. 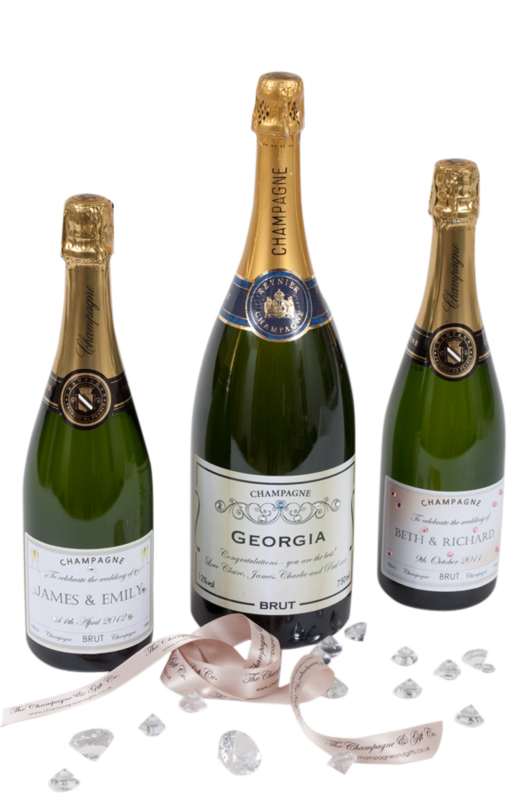 Shop our collection to find the perfect personalised wedding Champagne gift for you. 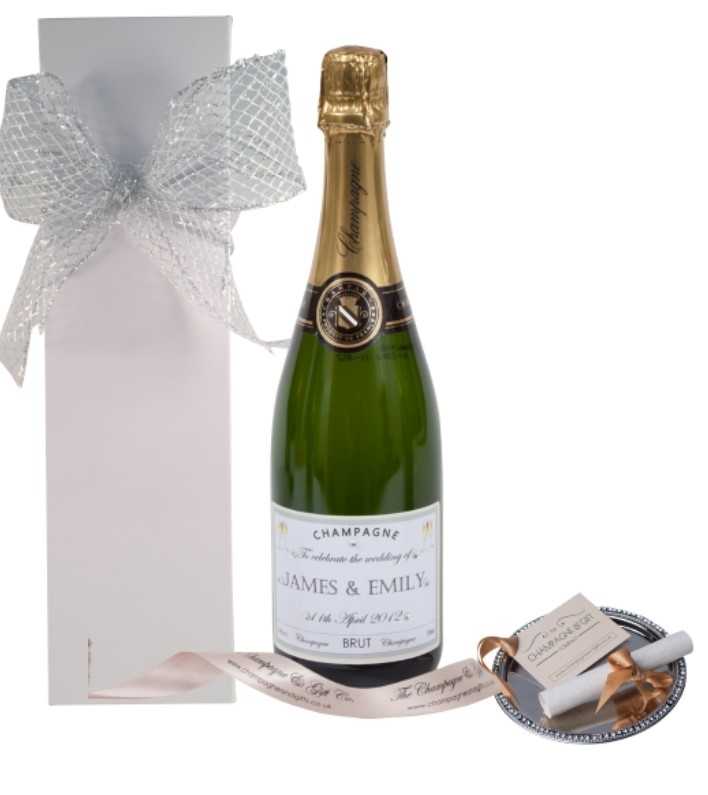 Our personalised wedding Champagne gifts include a personalised bottle of wedding Champagne that is presented with a stylish hand-tied bow. 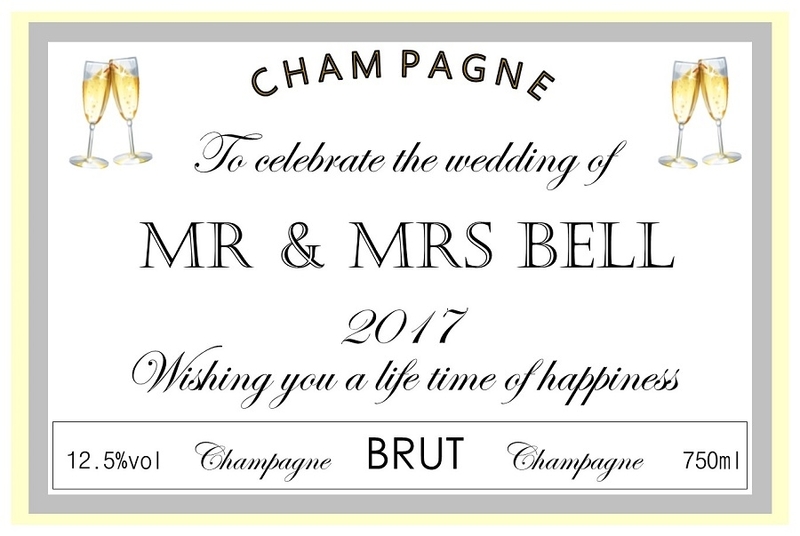 It's easy to create your own personalised wedding Champagne gift using our online label designer. 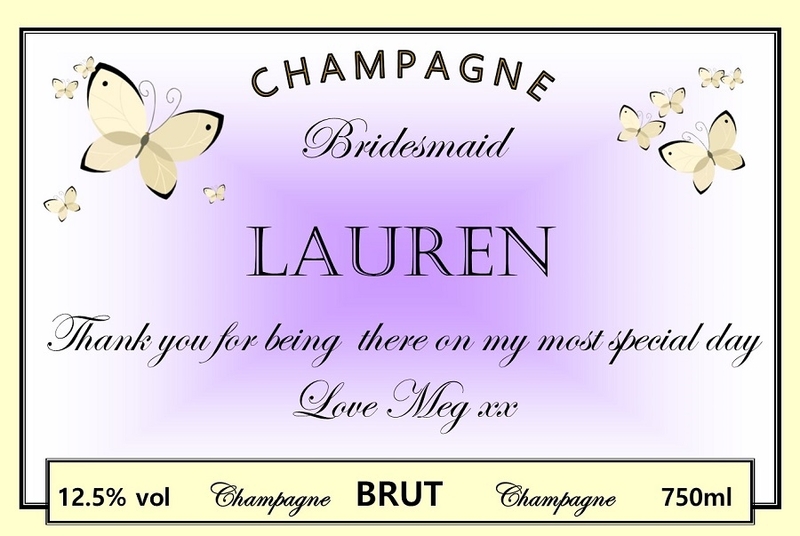 First, choose from our stunning selection of label designs and add your personalised message. To finish your special wedding Champagne gift, write your free gift message card and choose from our luxurious extras in "Finishing Touches". Our personalised magnum of Champagne - a stunning table centrepiece! Surprise the bride and groom with a personalised Jeroboam of Champagne, containing four bottles of Champagne, it is ideal for guests to toast to the happy couple. 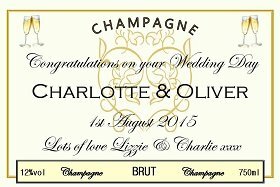 We can create a personalised wedding Champagne label incorporating the names of the newlyweds, the date and your special message. We can also decorate the personalised wedding Champagne bottle with Swarovski inspired crystals to add extra sparkle to the reception! 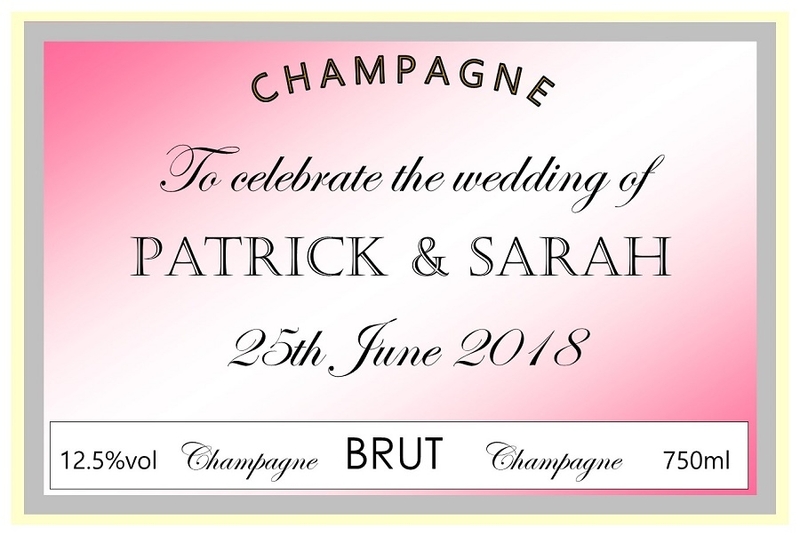 Contact us to discuss your personalised wedding Champagne label design, we are delighted to help and can even create labels tailored to your colour scheme. 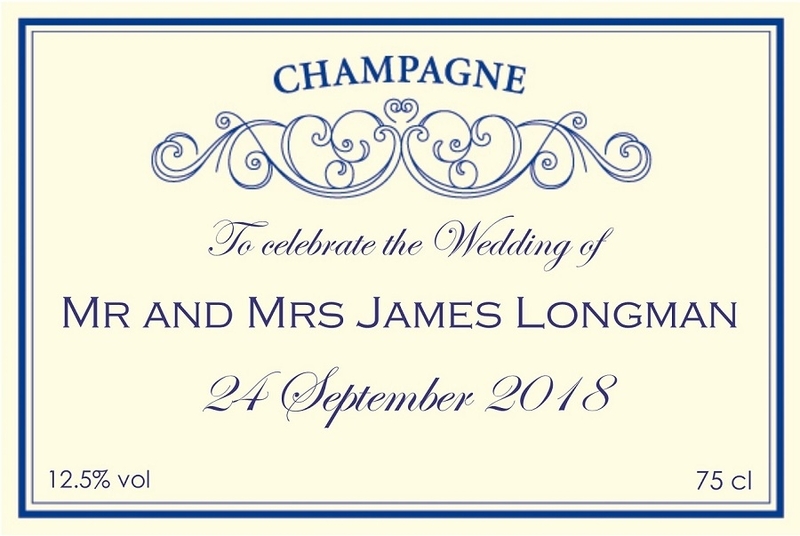 Our exclusive Personalised Champagne labels are also available in a range of designs suitable for commemorating special anniversaries and can be personalised by adding the couple’s names, a message and significant year. Each bottle also comes with an individual gift card with the name of the recipient and your own message. Gift wrapping and gift boxes are also available as optional extras. 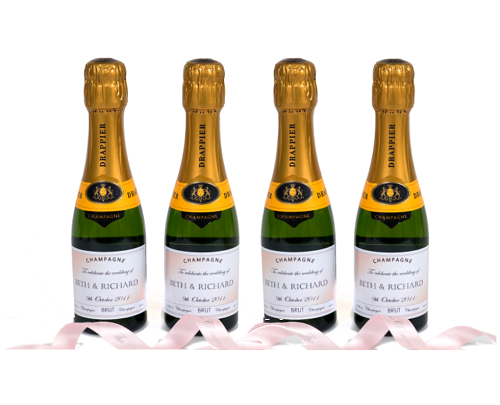 Our personalised Champagne gifts can be personalised individually by changing the text or uploading a photo. 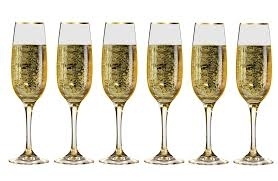 We also supply branded corporate Champagne gifts. 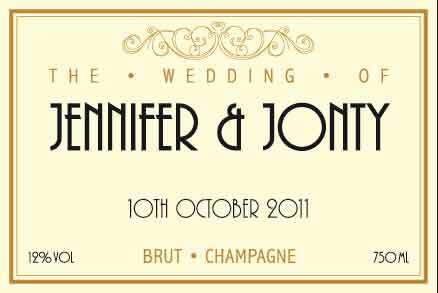 We have a superb range of label designs to choose from and creating a personalised Champagne bottle is quick and easy to do. Send a personalised Champagne gift today. Champagne gifts delivered to UK and International destinations.